One of the biggest stories of the baseball off season was what was going to happen with Robinson Cano and his free agency. Most people figured Cano and the New York Yankees would somehow meet in the middle of his 10-year/$300 million asking price and their 7-year/$170 million offer. After initial talks, the New York Yankees bumped their offer from $170 million to $175 million and stayed put there hoping they would have home field advantage in his decision. For Cano and new agent Jay-Z the price was just not cutting it for the All-Star second baseman. The former New York Yankee made his decision and went for a 10-year/$240 million deal with the Seattle Mariners, taking his talent out west instead. Cano who was in many people's view in line to become the next "face" of the Yankees after Jeter would eventually retire went for the money instead of the legacy. What does this move mean for the Seattle Mariners and Robinson Cano next season? No doubt, the acquisition of Cano automatically puts Seattle in a better position. It was clear though that they would need to fill out their lineup to have stronger bats around Cano. During the Winter Meetings they went out and signed Corey Hart from the Milwaukee Brewers and trading for OF Logan Morrison from the Miami Marlins. They were set on finding bats to show Cano he wouldn't be the only one in the line up that could hit the ball. The biggest concern for Cano and his new team is the fact that he won't be playing a lot of his games in hitting ballparks anymore. The AL East plays mostly in hitting ballparks while the AL West does not. Cano will probably see his numbers decrease and that will be something he has to get used to. That wall in right field at Yankee Stadium won't be his home turf anymore. 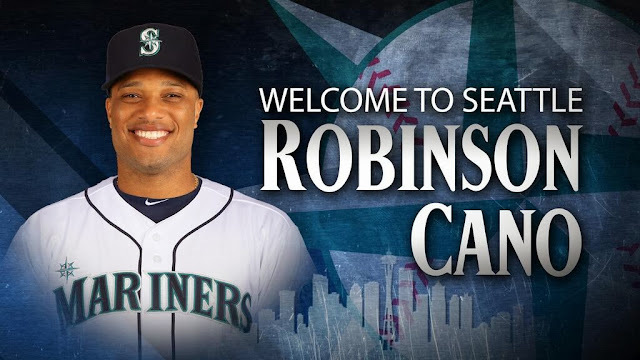 I watched the press conference the Seattle Mariners held today to officially introduce Cano. He seemed very excited to be in his new jersey (#22) and stated how much he loved the staff in Seattle and how they are treating him. When asked about the New York Yankees he said honestly that he would miss it. Being on the team for nine years and winning a championship will be something he remembers but he stated it was "time to turn the page." Cano thanked the fans for being so welcoming to him and his newest club. I don't think he will be doing the same in the future to the Yankee fans though, as they haven't hesitated to completely turn on their former second baseman. As Cano stated during the press conference, this game is also a "business" and he had to do what it best for him as a player. Seattle will visit Yankee Stadium in April and there will no doubt be plenty of people cheering against him as he steps to the plate.